Our Mar Vista client kept us busy in 2016 and they're keeping themselves busy too! They welcomed a baby boy in February (2017) and we were happy to have their home ready just in time! 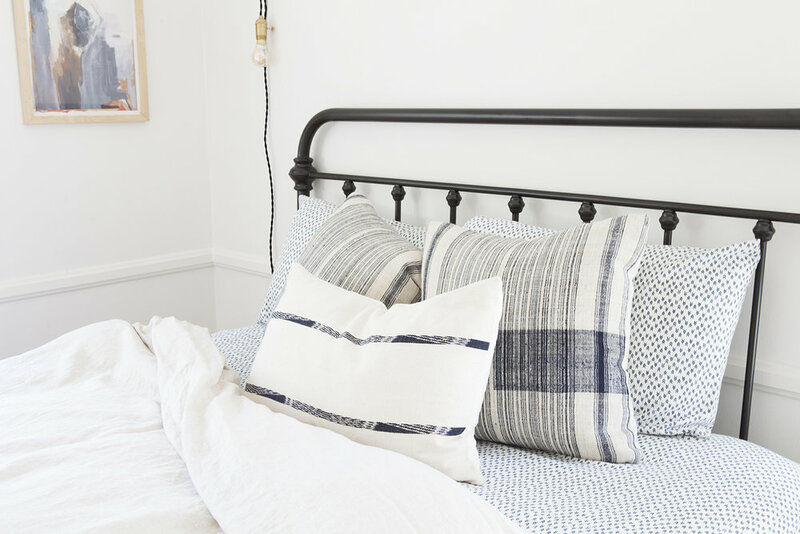 We put our touch on nearly every room in the house including this (guest-ready) guest room that was completely transformed into a vintage-modern style without breaking the bank. Check out these Before + After photos, what a difference! 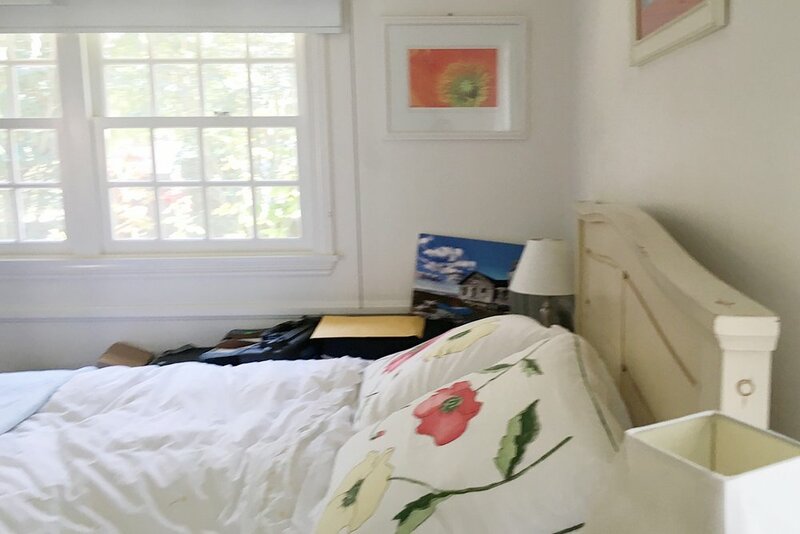 The guest room is just off the den and dining area (which got some major updates) so our clients wanted the room to be up to par with what's happening in the rest of the house. They didn't want to spend a fortune though. Our first thought was to pull the rug from their media room (it was too small for that space) and repurpose it for use in the guest room. It's the perfect size to work under a queen bed, and was a great way to save some money - so we knew we had to use it. It instantly added coziness and served as our color and mood inspiration. The rug itself has a traditional style pattern (see a similar version here) so we wanted to give the room a vintage-modern look that would compliment it. You'll notice in the BEFORE photos that the room feels tight on space and the furniture felt heavy, even with it's light color. The solid wood pieces were nice but bulky. We switched out the bed with this metal headboard from Target. The new headboard has a vintage/ traditional look and the metal rod silhouette allows light to pass through, helping the room feel more airy. Next came bedding; a new linen duvet and sheet set from West Elm, topped with vintage textile pillows in off-white and indigo stripes. The framed abstract figure by artist Jane Feil adds a classic and elegant touch and the soft shades of blue, gray, lavender and brown really stand out against the white walls. The vintage-inspired pendant light adds an unexpected element twist that feels modern. We opted for just one nightstand to make more space in the room and to keep things from feeling too cramped. The sleek mid-century inspired style in a natural wood tone warms the room and keeps the air flowing, as opposed to using a nightstand with a flush to floor base. We topped the stand with an affordable lamp and simple white shade, a photo from the couple's wedding day and a succulent that is sure to be happy with all the natural light coming through those windows!